The 7th Spanish Wintercamp was held from 7 to 9 of March 2019 in Villanua (Huesca-Spain). 120 participants from Costa Rica, Germany, Poland, Norway and Spain took part. The camp was directed by Shihan Fernando Pérez, 6. dan and covered all aspects of kyokushin (kihon, kata and kumite). 26-27.01.2019 under the auspices of KWF Ukraine: Kyokushin kai Federation of Ukraine led by CR Dmytro Nikolaiev (4 dan), KWF kyokushin winter schools were held in the cities of Mykolaiv and Dnieper. 500 athletes from Mykolaiv, Dnipropetrovsk, Cherkasy, Zaporizhia and Kherson regions took part in the events. Every day students thoroughly trained their skills in two stages, the first training began (from 9:00 - 11:00) devoted to kihon and kata, the second training (from 14: 00-16: 00) focused on kumite training. All athletes were divided into groups by level of preparedness. Due to the large number of participants, several halls were used simultaneously. The "Kumite-marathon" became a real test for all participants, where everyone showed what he was capable of, mobilized all his strength to achieve the main goal - to become the best. On the third day, school participants passed certification (kyu-test), having increased their stylistic qualifications, and became proud owners of new belts. Exam requirement was successful completion of the condition test, basic technique of KWF Kyokushin test and the "Kumite-marathon"
26-27.01.2019 под эгидой KWF Ukraine: Федерация Киокусин кай Украины – Национальный представитель Дмитрий Николаев (4 дан), прошли зимние школы киокусин KWF в городах Николаеве и Днепре, в мероприятиях всего приняли участие 500 спортсменов из Николаевской, Днепропетровской, Черкасской, Запорожской и Херсонской областей. Каждый новый день каратэки тщательно оттачивали свое мастерство в два этапа, первая тренировка начиналась (с 9:00 - 11:00) посвящена кихон и ката, на второй тренировке (с 14: 00-16: 00) акцент был на кумитэ - тренинг. Все спортсмены были разделены на группы по уровню подготовленности. Из-за большого количества участников использовалось одновременно несколько залов. Настоящим испытанием для всех участников стал «Кумитэ-марафон», где каждый показал на что способен, мобилизовал все силы ради достижения основной цели - стать лучшими. На третий день участники школы прошли аттестацию (кю-тест), повысив свою стилевую квалификацию, и стали гордыми обладателями новых поясов. Требованием к экзамену было успешное прохождение кондиции, базовой техники киокусин KWF, и «Кумитэ-марафона». 25 - 26 January 2019 in the Sports Hall of Fighting YMCA Krakow took place with over 120 heads of centers, instructors and players Seminar combined with New Year's training. Trainings led by sensei Aleksandr Pichkunov 4 dan - medalist of Kyokushin World Championships, who fought and trained in Tokyo for several years in K-1 together with sensei Francesco Filho. Also participated coaches and players from Russia, Ukraine, Germany, the Czech Republic and Romania, including Shihan Sergey Soldatow and sensei Janusz Konieczko. In addition, there were: shihan Robert Kopciowski, shihan Robert Wajgelt, shihan Witold Stolarczyk, shihan Zdzislaw Niedzwiedz, shihan Janusz Piórkowski and shihan Boigdan Swiatkowski. The subject of the seminar were techniques and combinations for fighting. Sensei Pichkunov showed many specialized exercises used in professional boxing and K-1, which resulted in a lot of interest and many questions. The first training took place on January 25 at 18.30 - 20.30. The second special New Year training took place on January 26 from 11.00-13.00. From 15.00 to 16.00 took place Narada with the participation of 53 managers of the centers where organization of preparations for the next international events was held, such as the Tokyo Grand Prix on March 24, the Chicago Championships June, the European Championships in Porto, Portugal on October 18-19. The third training took place between 4:00 PM and 6:00 PM, followed by a photo session. 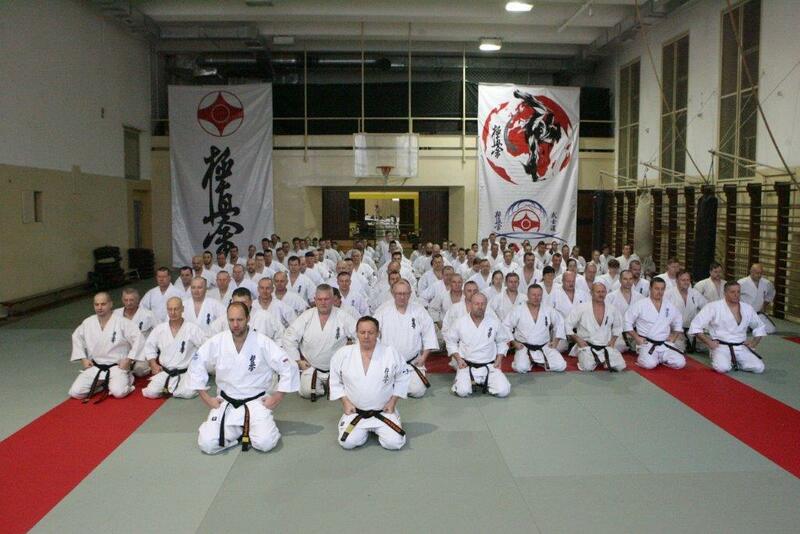 The organizer of the Seminar was the Polish Kyokushinkai Organization, whose leader is shihan Andrzej Drewniak. In 27.01.2019 was held the first on this year and very effectively seminar in OLIMPAVAN sport complex, with participation different age groups federation students. They also participated in master classes and gained experience. With their experience shared the most experienced world and European champions from Armenia. The seminarium was organised by the Armenian Kyokushin Federation led by sensei Spartak Gasparyan.